The murder of lawyer Peter Mihalik, who was shot outside Reddam House, a Cape Town school, sent shock waves that travelled beyond the immediate school community. The attorney, who represented many underworld clients, was killed last month in what is believed to be a hit and his son was shot in the jaw. Just a few weeks prior, a man was shot while on his way to work in Manenberg and three others were gunned down at a Nyanga taxi rank. Unlike the Mihalik shooting, which happened in a leafy suburb, the other two happened in townships – in underdeveloped, segregated areas, where flying bullets are a regular feature. As shootings like these escalate in South Africa, even in places that are in so many ways worlds apart, it’s surprising that gun violence isn’t a more commonly used phrase in the country, given that South Africa certainly has a serious gun violence problem. The SA Police Service annual crime statistics show that murder increased by 3% between 2011/12 and 2017/18. According to the latest national crime statistics, covering all reported crimes between April last year and March this year, 41.3% of murders and 59.5% of aggravated robberies in 2017/18 were gun-related. South Africa is ranked as the top country for recorded gun fatalities in Africa, based on firearm mortality data from 1990 to 2016. The country, which is also placed 12th among 195 countries on the list, is one of only two African countries that are featured in a top-20 ranking. This evidence makes clear that South Africa is in need of urgent intervention to reduce gun violence. 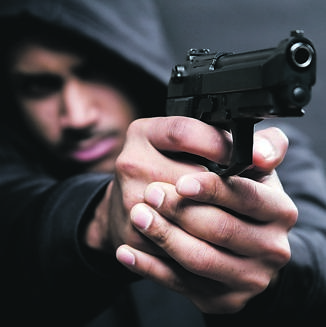 While guns are not the only weapons used by violent criminals, statistics show they are what Gun-Free SA describes as “overwhelmingly the weapon of choice to kill, injure, threaten and intimidate”. We know that an effective response to this violence must include strong gun laws because we’ve seen it work in the past. After the Firearms Control Act was passed into law in 2000, the average number of people shot and killed per day was halved. The law, which reduced the number of guns available in the country, also evidenced an extensive review of research which found that “the simultaneous implementation of laws targeting multiple firearms restrictions is associated with reductions in firearm deaths”. But the subsequent gains were set back a few years later, which coincided with mounting evidence of the law not being properly implemented owing to corruption, fraud, poor compliance by gun owners and poor enforcement of the law, which increased gun availability. This resulted in a steady increase of gun deaths and injuries. But those setbacks can be undone by amending our current gun laws to close the loopholes that currently exist and through strict enforcement of the law. Reducing access to guns is an essential part of this solution. Research shows that reducing gun violence requires a reduction in the availability of guns. Legal weapons often drive the supply of illegal ones that are used by criminals, so reducing the risk of firearm-related deaths will mean reducing the availability of guns, as the biggest source of illegal guns in the country is civilian gun owners. One way to address this would be by amending the firearms act to further regulate ownership and limit the number of guns individuals can have. Handguns, which are the preferred choice for many gun owners because of how light and easy to conceal they are, are also highly desired by those unable to access them legally. This must be coupled with urgent action against gun owners who do not comply with the law. Following a Constitutional Court ruling in June, an estimated 400 000 licensed gun owners were deemed to be in illegal possession of guns, based on their failure to renew their gun licences. Not only should their guns be confiscated through search-and-seizure operations, but they should also be charged for illegal possession of a firearm, which is a crime. Lastly, amendments to gun laws should also enable the ease of administration of the law, which includes reducing corruption and fraud in the firearms control management system. Reducing guns will not on its own end South Africa’s culture of violence, but the evidence is clear – it is a necessary step to reducing the deadliness of that violence and saving lives. Moeti has a long background in civic activism and has over the years worked at the intersection of governance, communication and citizen action.This year she was announced as an inaugural Obama Foundation Fellow and last year she was inducted as an Aspen New Voices Fellow. Follow her on Twitter. How can civic society work together with government to legislate, enforce and exercise gun control?